Across the top of The Cheviot, the path to the summit and the Pennine Way are paved with ¼ ton flags. English group. 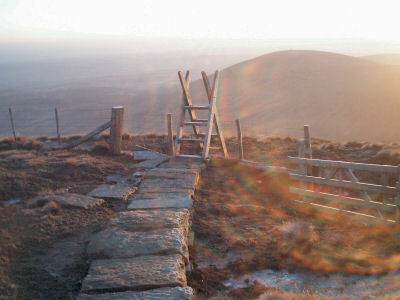 There are many possible ascents of this summit and many tracks or footpaths in the Harthope, Hawsen Burn, Lambden Burn, and College Valleys so while the shortest route to the summit is described below there are several other possibilities for anyone wishing to combine more of the scenery along with their activation. 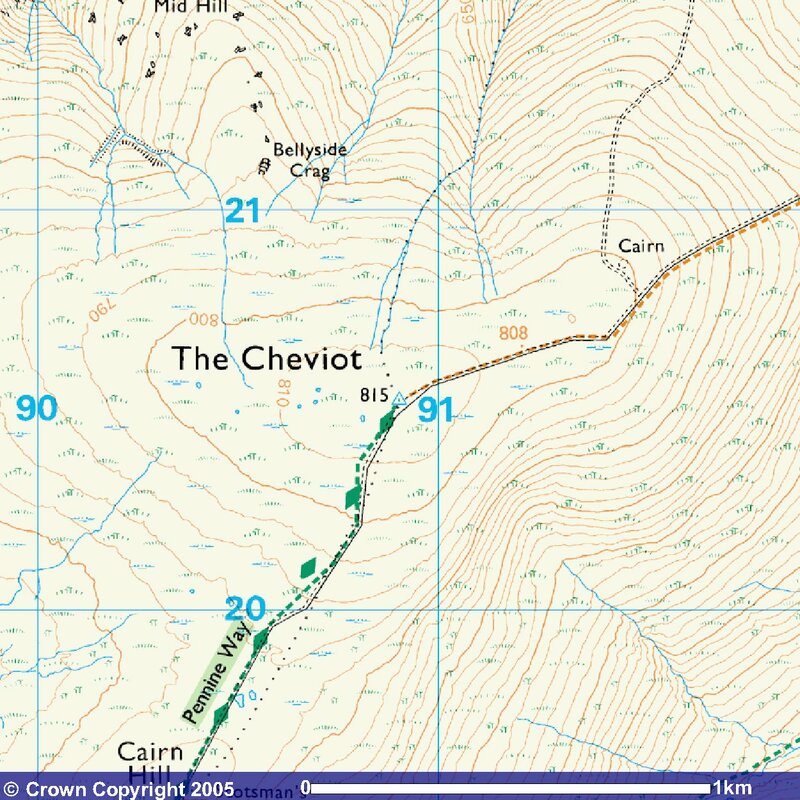 However be sure that any alternate route you may plan does lead to The Cheviot as casual hill walkers have been known to ascend Hedgehope by mistake thinking it was The Cheviot. Most of the area around The Cheviot became "open country" following the implementation of CRoW at the end of May 2005. However the area to the left of the road looking up the valley from the car parking area around Langleeford and a small area to the right of the road close to the parking area are not be included in the "open country" but this should be fairly obvious in that they are enclosed fields. Activators & Chasers should both be very happy that this summit lies just a mile inside England from the Scottish Border as it is worth 8 points whereas, if the ancient border had remained and this summit was on the Scottish side it would be worth only 4 points as a consequence of the height banding differences between the English and Scottish Associations. Simply because of it's height, activation via VHF should not present any problems as there is good line of site in almost all directions and a good signal into Northumberland and Tyneside. This summit has a clear path to all the other summits in the SB group though even in good visibility, it will not be easy to identify those other summits by eye. Summit to summit should be possible with others of the SB group, many of the SS group, TW, NP & LD and possibly much further afield depending on conditions although most likely are NP and LD since those summits are more regularly activated. From the south take A1 north and branch left onto the A697 north of Morpeth just before the dual carriageway converges to single carriageway. Follow the A697 through Longhorsley, Longframlington and Powburn to Wooler. As you enter Wooler and cross the river, take the left fork marked town centre up the hill. At the top of the hill, as you face the Anchor Inn, you take a very sharp left turn into Cheviot Street and follow the minor road to Middleton Hall. On that minor road you'll come to a fork where you take the right branch. At Middleton Hall, turn sharp right, up a steep hill, to follow the minor road along the Harthope Valley to find car parking beyond Langlee Farm. As you drop down Skirl Naked into the valley you may come across a significant number of cars parked on a grassy area to the right of the road, just before Carey Burn Bridge - do not stop here but continue for a further 3 miles approx. The parking areas are just grassy areas on either side of the road at NT 95340 22530 near Hawsen Burn and there is a sign at the side of the road at this point advising that there is no parking beyond this point further up the valley. If you wish to avail yourself of public toilets before proceeding up the valley stop off in Wooler as the public toilets at the picnic area near Middleton Hall are now out of action as a consequence of government under-funding of the national parks. From the north west take the A697 south off the A68 at Carfraemill and after passing through Coldstream and crossing the border into England, proceed south to Wooler. It is probably easier to continue on the A697 to the other end of the village, rather than take any of the other signposted roads into the village. At the end of the village the A697 turns quite sharply left to cross the river while a sharp right turn off the A697 which you should take, leads up the hill to the village. At the top of the hill, follow the directions above as for from the south. From the north east turn off the A1 into Belford and from there take the B6349 for Wooler. At the T junction end of the B6349 turn right (north) onto the B6348 and follow that into Wooler. Reaching the A697 turn left (south) toward the end of the village and where the A697 turns quite sharply left to cross the river, turn right instead and proceed as for from the south. 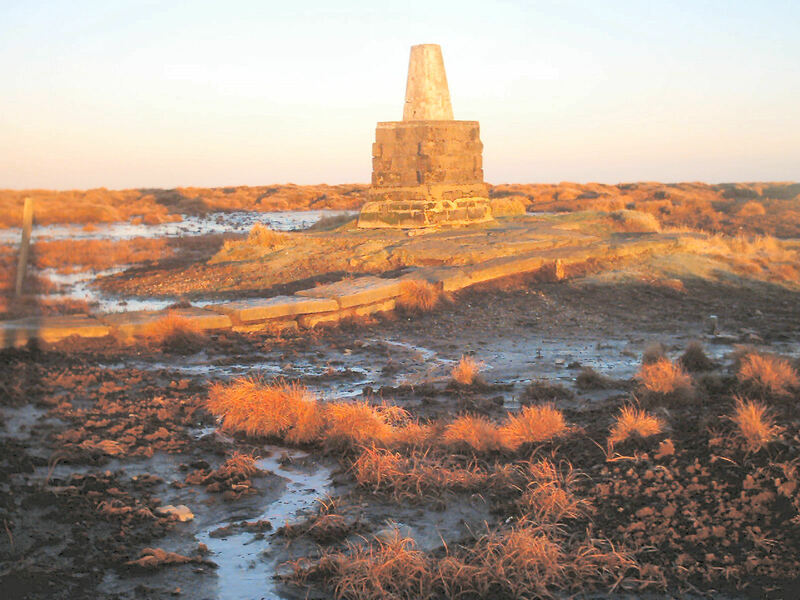 It is reported that when the trig point was first installed the ground level of the peat was almost up to the base of the trig, so what we see today represents over 1 metre of erosion across the top of The Cheviot probably through wind erosion. 260-300 yards to a wooden fingerpost on the right side of the road that indicates a footpath to Scald Hill and The Cheviot and follow this off the road up the hill. The track is fairly easy to follow and leads first to the minor summit of Scald Hill (549m). Once over Scald Hill the track to The Cheviot is again fairly obvious but is very boggy in places. As you near the summit the path becomes solid as large quarter-ton flagstones have been laid over much of the summit path and beyond, where the Pennine Way crosses nearby. Much of the grasses that you can see either side of the path are quite recent resulting from extensive replanting by the National Park. Before the large flagstones were helicoptered in, much of the summit area was churned up into a peat bog by the huge amount of pedestrian traffic. The summit itself is marked by the presence of a trig point around which there is a fairly small area of firm-ish land surrounded by peat bog. Although the summit area is very rounded and the potential activation area within 25 metres height of the summit is large, it is not easy to find a good place from which to operate away from the summit because of the general bogginess of the area. Last updated 17th Oct 2009. Please advise of any errors, even schpelling! !